There are plenty of places Dr. Seuss's famous eggs-and-ham-hating character won't eat a meal — not in a house, box, car, tree, or train — but there are hardly any locations Diana Prince considers off-limits for fights. New footage from Wonder Woman 1984, released exclusively at Warner Bros.' film slate panel during San Diego Comic-Con on Saturday, features Gal Gadot's Wonder Woman crash-landing in a shopping mall and whipping out her glowing Lasso of Truth to wrangle in two bad dudes brandishing guns. Before she brings the criminals to their knees, however, Wonder Woman shares a sweet moment with a little girl. 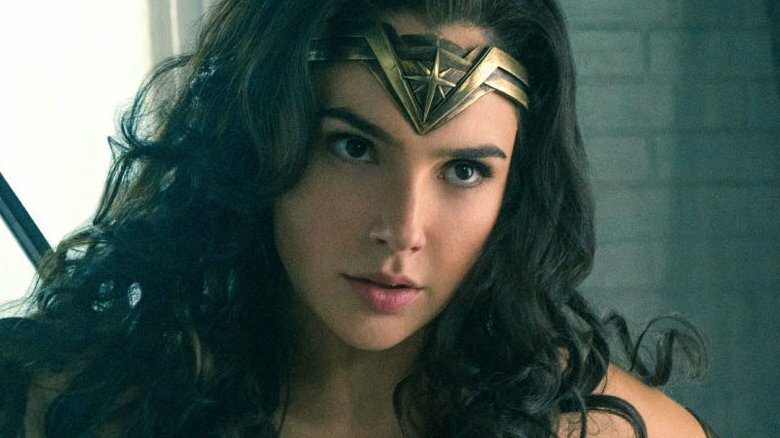 According to ComicBook.com press, who attended the Wonder Woman 1984 panel, the young fan exclaims, "Oh my gosh!" at the sight of Wonder Woman in full costume. The hero then ensures the child gets to safety, takes down the villains, leaps over a bannister to the floor below, and makes a mad dash out of the mall and onto the city streets. Director Patty Jenkins, as well as Gadot and her co-star Chris Pine, who miraculously reprises his role as Steve Trevor for the sequel, took the Hall H stage to unveil the footage, which has been described as a "rough cut" despite looking pretty polished. Speaking during the panel, Jenkins explained her vision for Wonder Woman 1984. "One of my favorite things about making the first movie in World War I, 1917, [was] getting to know the era. There was something about that time that was such the beginning of modernity," the director said (via IGN). "Here, I grew up in the '80s. It's its entirely own '80s movie with its own look and feel. It really was mankind at its best and worst. We're aware of some of the prices of our behavior nowadays, but we weren't then." Fans have actually already gotten a glimpse at what the shopping center in the sequel looks like, thanks to a previously released photo of Pine that featured him inside a mall, rocking a matching jacket-and-pants ensemble while he waits outside an ice cream parlor. Might the moment that image captures come just seconds before Wonder Woman's middle-of-the-mall showdown? It's certainly likely, and would mean that Pine's Steve Trevor doesn't simply appear in solo flashback sequences sans-Diana like some fans have speculated. We've yet to see video footage of Kristen Wiig's villain Cheetah (a photo of her in character on set was unveiled earlier this year), but considering Wonder Woman 1984 is only a few weeks into filming, it will likely be a while before we do. Wonder Woman 1984 will fly into theaters on November 1, 2019.